¶ 4 Leave a comment on paragraph 4 0 There are similarities between I Pity the Poor Immigrant and I Am a Lonesome Hobo. 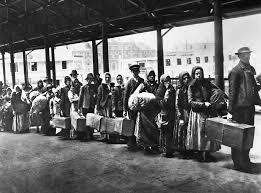 Like the hobo, the immigrant is portrayed in a very negative way. The hobo is “deceitful” as well as a thief. The immigrant is a cheat and liar. The hobo is not the lovable, carefree hero of the song Woody Guthrie made famous, Hobo’s Lullaby, and the immigrant is not the sympathetic fruit picker of Guthrie’s Deportees. ¶ 5 Leave a comment on paragraph 5 0 The song seems to be a warning to those contemplating major changes in their life with the sole aim of improved economic conditions. The lyrics warn that such a strategy will fail in the long run, that it will “shatter like the glass”. Wilfred Mellers, author of A Darker Shade of Pale, suggests the song “points a crooked finger at the American Dream“. ¶ 6 Leave a comment on paragraph 6 0 Some commentators have suggested the song may have it’s roots in Dylan’s own family’s experiences, given that his father was the son of an immigrant. Others have suggested that his manager at the time, Albert Grossman, played a role, himself the son of an immigrant. Robert Shelton, author of No Direction Home, suggests that all of us are immigrant or exiles from the Gates of Eden. Others think that Dylan might be talking to himself, accusing himself of dishonesty as he made a name for himself in the commercial music business, a continuation of I Am a Lonesome Hobo. ¶ 7 Leave a comment on paragraph 7 0 The author of an article in the Journal of Kerbala University has an interesting take. ¶ 8 Leave a comment on paragraph 8 0 People are unwilling immigrants in the land of living, exiled from paradise and placed into the broken happy temporal world where people must struggle against the temptations to do evil and instead choose to do good……. ¶ 9 Leave a comment on paragraph 9 0 The godless hate their lives, and trapped in a choice between two forms of torture, fear and death as well. Dylan, in this poem, talks about the immigrant who worships money and, God laments, “turns his back on me.” Then, after reviewing their mistakes the immigrant makes, Dylan speaking as God ending with “I pity the poor immigrant/ When his gladness comes to pass.” Here, it is a suggestion of a harsh judgment to come drains the expressed pity of mercy……. ¶ 10 Leave a comment on paragraph 10 0 Indeed, the poem is told from God’s point of view. It is about those who disobey. Dylan sings for God and sends a warning. ” I pity the poor immigrant/ Who wishes he would’ve stayed home”, In these lines God expresses pity; then the rest of the song is only a repetitive invocations of pity, talking in detail about how the immigrant uselessly disobeys, how he uses every power to cheat and lie without benefit; loneliness is the only result. The godless hate their lives, and trapped in a choice between two forms of torture, fear and death as well. ¶ 11 Leave a comment on paragraph 11 0 Like most of the songs on John Wesley Harding, I Pity the Poor Immigrant is full of biblical references. ¶ 18 Leave a comment on paragraph 18 0 Of course, it’s very well documented that early in his career Dylan often borrowed tunes from old folk ballads. The borrowing, often called the “folk process”, was very common at the time and not at all exclusive to Dylan. Dylan stopped adapting old melodies for his songs after The Times They Are A’Changin’. ¶ 19 Leave a comment on paragraph 19 0 This practice made a brief reappearance here though. The melody is borrowed from the old folk tune Come All Ye Tramps and Hawkers. 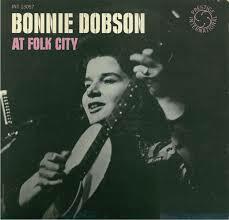 Shelton notes that Dylan may have remembered the tune from one of his early sixties Greenwich Village contemporaries, Bonnie Dobson, who frequently performed the ballad Peter Amberley which uses the same melody. Interestingly, Peter Amberly, is also about an immigrant’s journey that ends badly. Dobson had a hit with her song, Misty Dew Morning Dew, which has been covered by many artists, including Robert Plant. ¶ 20 Leave a comment on paragraph 20 0 Dylan played it for the first time at the Isle of Wright Festival, and hasn’t done it again since 1976, during the Rolling Thunder tour. I prefer the original, by far. ¶ 23 Leave a comment on paragraph 23 0 Gene Clark of The Bryds fame gave it a go. ¶ 25 Leave a comment on paragraph 25 0 So did Ricky Havens. ¶ 27 Leave a comment on paragraph 27 0 Also gospel singer Marion Williams. ¶ 29 Leave a comment on paragraph 29 0 And of course Joan Baez. The song is “Morning Dew”, not Misty Dew!!! whoops! fixed. thanks for pointing that out.